The Crown of Dom Pedro II was created by the goldsmith Carlos Martin in Rio de Janeiro, and was first exhibited to the public on July 8, 1841, just days before the new monarch's Coronation that took place on July 18 of the same year. The Crown's frame is made of quality 18 carat gold. Its circlet base supports eight imperial semi-arches, connected at the top by a golden monde, which in turn is surmounted by a jeweled cross, forming a globus cruciger. Inside the half-arches lies a dark-green velvet cap (matching the dark green colour of the top surface of the Emperor's robe). The Crown is set with 639 precious stones (all diamonds), and 77 pearls of 8 millimeters each. 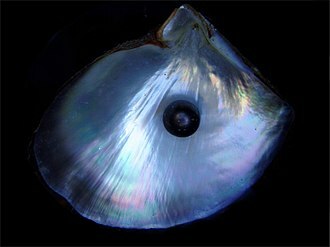 This Crown weighs 1,9 kilograms, has a diameter of 205 millimeters and is 31 centimeters high. 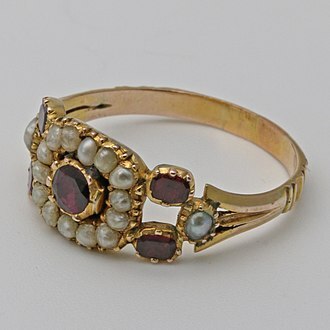 It is considered one of the most splendid works of Brazilian jewelry. Emperor Pedro II, wearing several elements of the regalia, and crowned with the Imperial Crown of Brazil, here portrayed arriving to deliver the Speech from the Throne in the opening of the annual session of the Brazilian Imperial Parliament (General Assembly) in 1872. Painting by Pedro Américo. 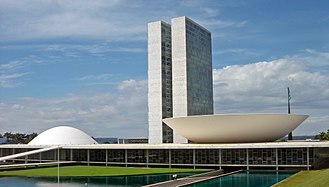 Aside from the Coronation Mass, it was customary for Brazilian Emperors to wear their crowns only twice a year, for the ceremonies of opening and closing the session of the Brazilian Imperial Parliament, when the Emperor appeared in full regalia to deliver his Speech from the Throne. Upon the abolition of the monarchy in 1889, the government of the newly proclaimed republic took possession of all items of the Imperial Regalia, but, unlike what happened upon the abolition of other monarchies, no item of the Crown Jewels was sold or destroyed. Since 1943, the Imperial Crown of Brazil and all other items of the regalia have been kept on permanent public exhibition at the Imperial Palace in the City of Petrópolis, now converted to the Imperial Museum of Brazil. Before the inauguration of the Imperial Museum in 1943, the Imperial Crown and other items of the Brazilian Crown Jewels were kept under lock and key in possession of the Department of the Treasury. The Imperial Crown is the property of the Brazilian State. In the first years of the 21st century, Brazilian Jewellers Amsterdam Sauer created a replica of the original Imperial Crown of D. Pedro II. The creation of the replica, using 19th century techniques not employed nowadays, took 18 months. 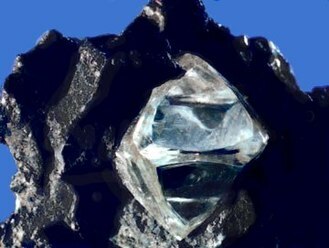 The replica is on display at Amsterdam Sauer's Museum of Gemstones and Rare Minerals in Ipanema, Rio de Janeiro. The replica is heavier and larger than the original Crown. It weights 2,77 kilograms and is set with 596 stones totaling 911.84 carats. ^ a b Web site of the Imperial Museum, "The crowns". 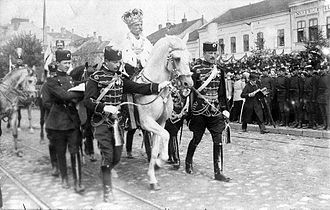 Serbia, like most former monarchies of Europe, has had crowns once worn by its rulers. The various Serbian principalities and kingdoms were organised around a number of different royal dynasties, many of these invested in symbols of royalty which has led to a number of distinctive crowns and other treasures of incredible wealth surviving to the present day. 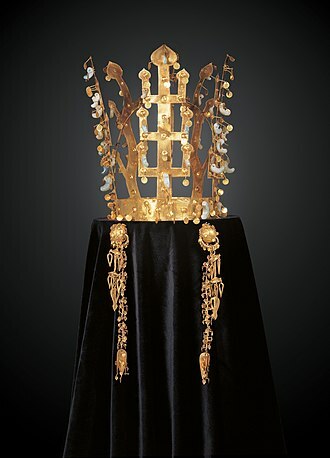 As far as is known, there are four royal crowns once worn by Serbian kings or princes that have survived to the present day, the Nemanjić Crown Jewels are the oldest of the surviving pieces of Serbian royal regalia. They were used in the ceremonies of members of the medieval House of Nemanjić. 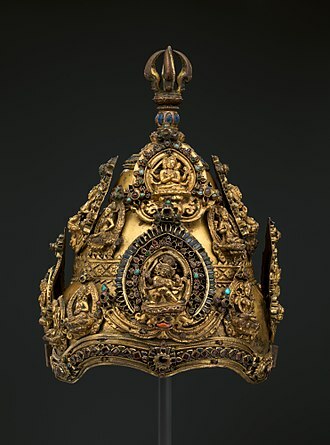 The 14th Century Crown of King Stephen III is kept at Cetinje Monastery in the Republic of Montenegro, another crown which had once belonged to medieval Serbian rulers is kept in the Royal Treasury museum in Vienna, Austria. Also, at the Vienna Royal Treasury are found two further crowns once worn by members of the medieval Nemanjić dynasty, one of which was attributed to Prince Stefan Bockaj. 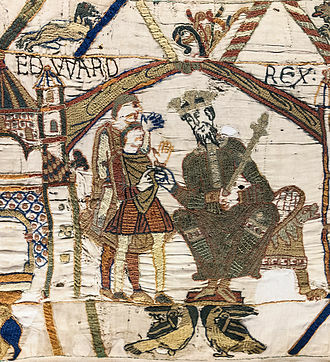 In art, the crown may be shown being offered to those on Earth by angels. In religious art, a crown of stars is used similarly to a halo, crowns worn by rulers often contain jewels. A crown is often an emblem of the monarchy, a monarchs government, the word itself is used, particularly in Commonwealth countries, as an abstract name for the monarchy itself, as distinct from the individual who inhabits it. A specific type of crown is employed in heraldry under strict rules, costume headgear imitating a monarchs crown is called a crown. Such costume crowns may be worn by actors portraying a monarch, people at parties, or ritual monarchs such as the king of a Carnival krewe. The nuptial crown, sometimes called a coronal, worn by a bride, in the present day, it is most common in Eastern Orthodox cultures. The Eastern Orthodox marriage service has a section called the crowning, wherein the bride and groom are crowned as king, in Greek weddings, the crowns are diadems usually made of white flowers, synthetic or real, often adorned with silver or mother of pearl. They are placed on the heads of the newlyweds and are held together by a ribbon of white silk and they are kept by the couple as a reminder of their special day. In Slavic weddings, the crowns are made of ornate metal, designed to resemble an imperial crown. A parish usually owns one set to use for all the couples that are married there since these are more expensive than Greek-style crowns. This was common in Catholic countries in the past, a Crown of thorns according to the Bible, was placed on the head of Jesus before his crucifixion and has become a common symbol of martyrdom. According to Roman Catholic tradition, the Blessed Virgin Mary was crowned as Queen of Heaven after her assumption into heaven and she is often depicted wearing a crown, and statues of her in churches and shrines are ceremonially crowned during May. The Crown of Immortality is common in historical symbolism, dancers of certain traditional Thai dances often wear crowns on their head. These are inspired in the worn by deities and by kings. The Empire of Brazil was a 19th-century state that broadly comprised the territories which form modern Brazil and Uruguay. 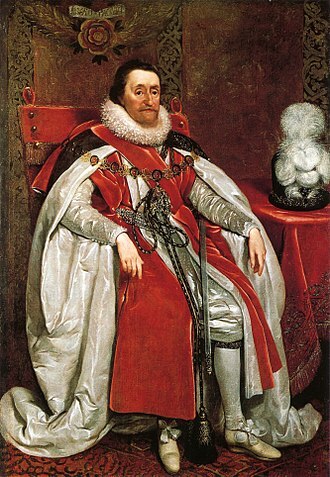 Its government was a parliamentary constitutional monarchy under the rule of Emperors Dom Pedro I. João VI returned to Portugal, leaving his eldest son and heir, Pedro, to rule the Kingdom of Brazil as regent. On 7 September 1822, Pedro declared the independence of Brazil and, after waging a war against his fathers kingdom, was acclaimed on 12 October as Pedro I. 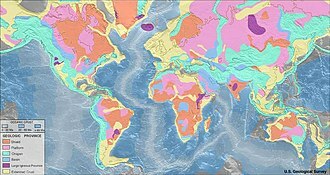 The new country was huge but sparsely populated and ethnically diverse, the empires bicameral parliament was elected under comparatively democratic methods for the era, as were the provincial and local legislatures. This led to an ideological conflict between Pedro I and a sizable parliamentary faction over the role of the monarch in the government. The unsuccessful Cisplatine War against the neighboring United Provinces of the Río de la Plata in 1828 led to the secession of the province of Cisplatina. In 1826, despite his role in Brazilian independence, he became the king of Portugal, two years later, she was usurped by Pedro Is younger brother Miguel. Unable to deal with both Brazilian and Portuguese affairs, Pedro I abdicated his Brazilian throne on 7 April 1831, Pedro Is successor in Brazil was his five-year-old son, Pedro II. As the latter was still a minor, a regency was created. 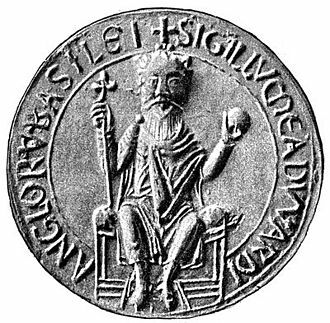 The power vacuum resulting from the absence of a monarch as the ultimate arbiter in political disputes led to regional civil wars between local factions. Brazil was victorious in three international conflicts under Pedro IIs rule, and the Empire prevailed in other international disputes. With prosperity and economic development came an influx of European immigration, including Protestants and Jews, which had initially been widespread, was restricted by successive legislation until its final abolition in 1888. Brazilian visual arts and theater developed during time of progress. Although heavily influenced by European styles that ranged from Neoclassicism to Romanticism, the next in line to the throne was his daughter Isabel, but neither Pedro II nor the ruling classes considered a female monarch acceptable. Emperor Pedro II and Empress Teresa Cristina at the Palace's garden in 1888. The Imperial Crown of Brazil exposed. 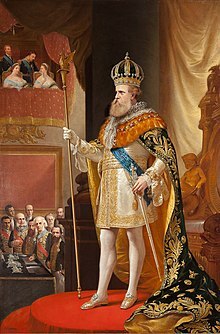 Emperor Pedro II wearing the Imperial Regalia, by Pedro Américo. Getúlio Vargas with other leaders of the Revolution of 1930 in Itararé, shortly after the overthrow of President Washington Luís. The straight sword on display in Vienna. The sheath of the straight sword. Crown of Rudolf II The Crown of the Austrian Empire.